I don’t know if I’ve mentioned this before, but I have a weakness for arepas and I eat them almost every day for breakfast. Eating arepas makes me happy and connects me with my country. In Colombia we eat all kinds of arepas and these Arepuelas or Anisitas (sweet arepas) are very popular on the Atlantic coast of Colombia. You can eat them with hot chocolate for breakfast or just as a quick snack with coffee. They are crispy, sweet and delicious. Enjoy! Combine the masarepa, warm water, anise seeds and sugar, mixing thoroughly. Let mixture stand for five minutes. Knead with your hands for about 3 minutes, moistening your hands with water as you work. Form 6 small balls with the dough. Place each ball between 2 plastic bags and with a flat pot cover, flatten to ¼ inch. Heat the vegetable oil in a large heavy pot to 350 F. Add the arepas in the heated oil one by one, fry for 3 minutes, turning over once about half way through. Yum! Those sound so perfectly crisp and I love the flavors with anise! 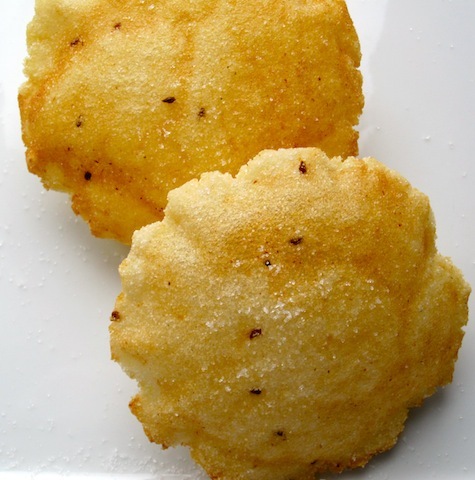 I have always wanted to make arepas…those look delicious! This sound so appealing. Crusty and sweet with a touch of aniseed! Very moorish indeed!! Popped in from Barbara’s to say hi! You have a fascinating blog! Oh I love this! it reminds me of “arepitas” that we make in The Dominican Republic, we use corn meal, anise seeds, eggs, milk and some butter, we eat them at lunch time as a side dish, will definitely make this soon, yum! Thank you guys for visiting my blog! Erica, what can be substituted for the anise? Baking is my Zen- The anise is very important in this recipe! These anisitas look delicious. I love anything with anise flavoring. Thank you all for the comments! I truly appreciate it! I would want to eat them every day too! What a lovely way to start the day! Arepas sounds like a great snack! I would probably pop them in my mouth compulsively. I’m an arepa lover too, but this is one of my favorites! I haven’t had one in ages!! I’m so glad I discovered this page in English….now I can share with my friends and show them how wonderful is our Colombian food. I’ve not even had arepas for breakfaset yet and I know I’d have a weakness for them as well. As delicious as they look I’m scared to get started =) The addition of anise sounds like something special. How lovely and delicate looking. I’ve never had one and will have to make these! I am with you – I love arepas. This is a keeper because it has one of my favorite flavors…Anis. These look crispy and so delicious! Perfect with the anise flavor! Hi Erica. I lived in Medellin for 6 months a few years ago and hardly a day goes by that I don’t crave some Colombian food! About a month ago I finally learned how to make the large flat arepas that are so popular in Medellin. 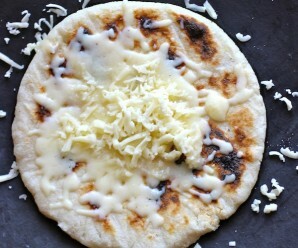 (Which I love toasted with butter and queso blanco.) I can’t wait to try these. Isn’t anise the flavor in Agua Diente? Hmmmm. Ha ha. Love this site. Eddie- Yes, Aguardiente is made with anise! I am so excited to find your blog. Colombian cooking is so strange to me, but you definitely help!! Thank you all for taking the time to read my post! What a beautiful delicacy!! This looks like Indian pooris, except with cornmeal and sweet. The anise must be adding nice flavor. 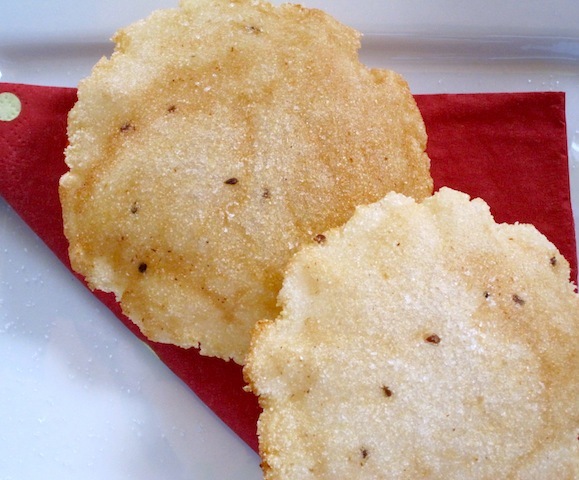 Hello Erica; made these Arepas con Anis…tremendas!!!! 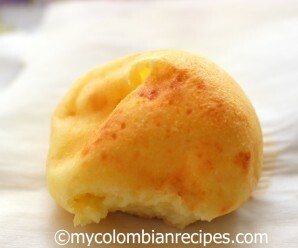 un favor, podrias poner las recetas para los diferentes tipos de bollos de colombia? Vivi en B/Quilla y me gustaria, si no probarlos nuevamente, verlos en fotos aunque sea!!!! Mery- Los bollos de Chocolo estan en mi lista de recetas. I am an expat living in Melbourne and since I found your website I have been getting re-acquainted with Colombian food! I had tried before with other cookbooks but your recipes are always so easy to follow and the measurements are just perfect! even my Aussie husband has made one of your dishes and it always comes up delicious! hi! i just wanted to let you know that a whole bunch of kindergardeners are going to be making your anisita arepas on friday!!! they are syudents in an all spanish immersion school in new orleans, la. and this is the recipe they will be making to represent colombia!!! it is the end of the year, and they are seasoned little cooks now.. they can handle it! thank you soooo much for posting it with that lovely photo! mmmmm! If you don’t want to add anise seeds, what do you substitute it with? Should I add more sugar? Thanks Erica, I remember my grandma used to make these every morning on weekends! Can’t wait to try them this weekend and have my son try them… start our own tradition! Thank you sooooo much for this! I made them today and they were a success!! Reminded me of my grandmother!! I just added a little more sugar. The first two batches I burnt them but I got the hang of them after that. My boyfriend and son were impressed! Thank you! 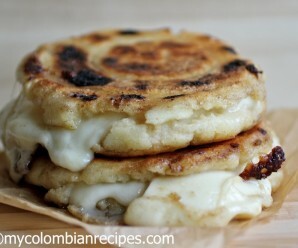 Next one I will try is the arepas with the cheese inside! Hola Erika. Hace poco hice estas arepas para mi familia y la verdad, les gustaron mucho. Ahora estoy en la doble misión de compartir y/o hacer las arepas con varios de mis amigos y averiguar con qué puedo acompañar esas arepas y que les hagan buen contraste y/o maridaje (puede ser alguna carne o alguna bebida). Gracias tenia tiempo sin comer esta deliciosa arepa , soy de Venezuela y alla ya casi no las hacen a pesar que es típica de Venezuela también. My mother made these for me as a child and now for my children. But she has never told me the recipe or taught me. I’m sure this is the one because I remember the anise! Question – the Columbian recipe book I have included cheese is that something not needed? They are different variations. I don’t like to add cheese to my recipe. 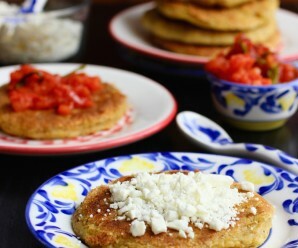 My mom was a cartagenera through and through; she would make these often for our family. Today is the anniversary of her passing and I wish I could taste these treats from her again.